Mount Joy, Penn. – September 9th, 2014 – Pinkerton Road Studio today announced that the highly-anticipated Gabriel Knight: Sins of the Fathers® 20th Anniversary Edition, a modern remake ofone of Sierra ‘s greatest adventure games of all-time, will be available for purchase on PC and Mac on October 15th, 2014. Licensed from Activision Publishing, Inc, overseen by original series creator Jane Jensen, and developed in partnership with leading indie team Phoenix Online Studios, this high-definition update of the adventure game classic Gabriel Knight adds brand new puzzles and scenes, gorgeous new high-res backgrounds, a remastered soundtrack, and more New Orleans flavor to the beloved original story, plus exclusive new behind-the-scenes material including original concept sketches, articles and brand new audio interviews with Jane Jensen and members of the original Sierra development team to provide a more complete view on the Gabriel Knight series than has ever been available before. Pre-orders are now available at Steam, GOG.com, the Phoenix Online Store and more at 15% off the $19.99 retail price, and include the pre-order exclusive soundtrack by Robert Holmes. The game will also offer players never before seen behind-the-scenes special edition content on both the original and the remake. 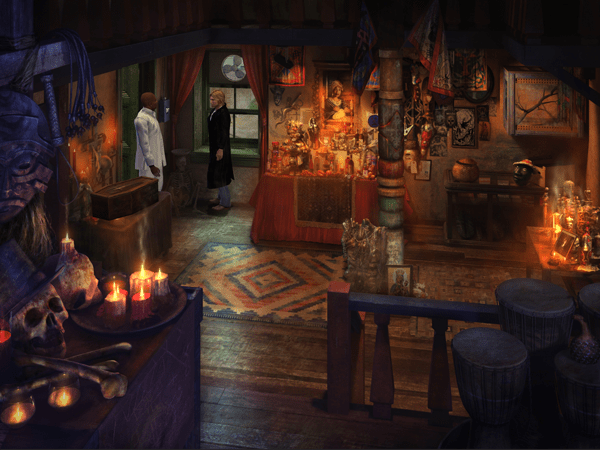 Extras include original concept art, magazine articles, interviews and brand new behind-the-scenes insight and one-on-one interviews with Jane Jensen and members of the original Sierra development team to provide a more complete view on the Gabriel Knight series than has ever been available before. Hailed by Adventure Gamers as one of the most well-written games ever and given an Honorable Mention in the AV Club’s Top 100 Games of All Time, Gabriel Knight: Sins of the Fathers 20th Anniversary Edition invites players to relive the classic voodoo murder mystery that’s captivated generations of game enthusiasts for two decades. In the game, players will take on the role of roguishly handsome Gabriel Knight, a struggling author and owner of a bookstore in New Orleans, who is investigating the Voodoo Murders for his new book: a series of savage ritual killings surrounded by voodoo trappings. But his search into the dark underbelly of New Orleans will reveal far more than who’s behind the killings, as Gabriel is drawn to the beautiful and aloof Malia Gedde, learns the secrets of his family history, and must comes to grips with his own destiny if he’s going to survive. “It’s been a dream to be able to work on Gabriel Knight again, and I’m so exciting to bring it to a new audience. I think it looks amazing and it has all the classic gameplay,” said Jane Jensen, creator of the series. More information is available at www.GabrielKnight20th.com.